Trustees use a certification of trust in the place of furnishing a copy of the trust instrument to any party who does not have a beneficial interest in the trust. In Washington, D.C., the certification is governed by D.C. Code 19:1310.13. The certification verifies the existence of the trust on behalf of which the trustee is acting and affirms the trustee's authority. It presents only essential provisions of the trust instrument, such as the trust's name and date of establishment, the identity of the trust's settlor, the acting trustee's name and address, and the powers of the trustee relevant to the transaction for which the certificate is requested. The interests of any trust beneficiaries remain confidential. In addition, the certification states whether the trust is irrevocable or revocable, and, if the latter, who holds the power to revoke the trust. If there are multiple trustees, the identity of each trustee who can sign documents relating to the trust is disclosed, as well as how many are required in order to exercise the power of the trustee. Finally, the certification requires the trust's taxpayer identification number (either a SSN or an EIN, depending on the type of trust), the name by which the trust will take title to real property, and a statement that the trust has not been revoked, modified, or amended so as to cause the representations within the certification to be incorrect. 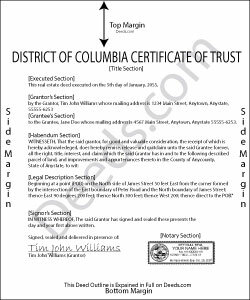 Since the certification of trust relates to real property, space for a legal description of the subject real property or properties held by the trust is included in the form. Legal descriptions in the District of Columbia require lot number, square, and subdivision. The recipient of a certification of trust can act on the information presented within as fact. They may also request copies of excerpts from the trust instrument relating to the trustee's appointment and relevant powers, but may assume without inquiry the existence of the facts contained in the certification (D.C. Code 19:1310.13(f)). Consult a lawyer with any questions regarding trusts and trust certifications.